The good weather over the last month provided us with a perfect opportunity to take some updated drone photos of the site. These provide an excellent record of progress on the new roads, canal and public square works in particular. The first section of canal lining has been completed and we will continue to work north to south over the next few months. We are changing to a puddle clay liner once we reach the section where the banks need to be lined as well as the base and this also provides us with opportunities to install temporary bunds across the canal and start filling up the northern sections. In the public square, south of the Hall and Woodhouse development, the concrete has been poured for both the ramps and the three raised planters in the square which you can see in more detail on the image below. 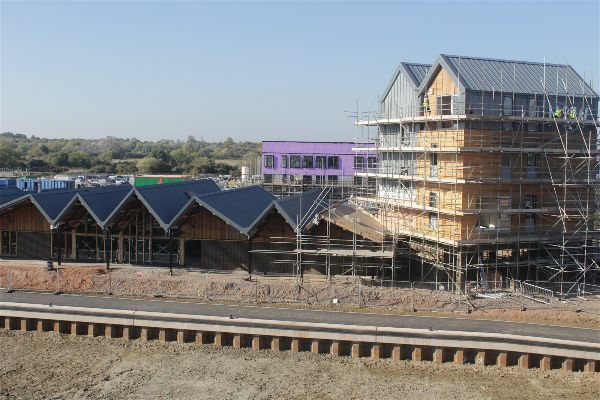 The focus at both the Deanery and Hall and Woodhouse sites has been on progressing the internal works as well as the finishing touches to the buildings including brickwork and wooden cladding. The first section of scaffolding has been removed from the pub and you can now start to see the details of the building behind. It has also been a year since we started capturing time lapse footage of construction activity. We’ve pulled together a 50 second clip of the last 12 months and it is fantastic to see how much it has changed. We have been continuing to work on the design of the first Joint Venture housing parcels and have also been working on an update to our branding. To reflect the start of the partnership with Barratt and David Wilson we have added a hexagon to our main logo. This will eventually be joined by individual hexagons for each of the new development phases starting with Canalside. These will start to pop up on our website and signage across the site as the development moves forwards.